I was on a shoot this last week playing around with my new um200c and I wanted to track the battery life it was getting. Normally you could look in the manual to see the battery life chart but battery size has come along way since the um200c came out. That’s when I came across this awesome App called Watson! It lets you run multiple stopwatches at the same time. You can also group stop watches and label every little detail. Now this feature does exist in the Lectrosonics SR series, Zaxcom lineup, Sony UWP and Wisycom but it’s a feature that’s buried in the menu. This is a simple app that will display can display all your transmitters in one spot. It’s 100% with a minor banner ad but you can buy a ad free license for $1.49. 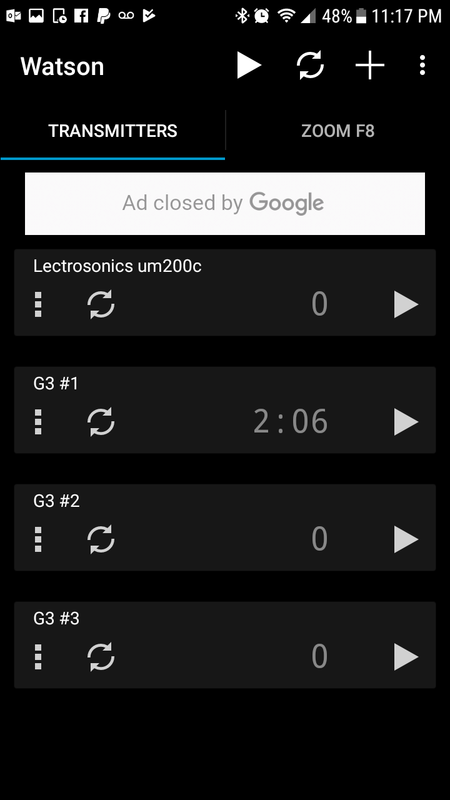 Now the Sennheiser G2, G3, and 2000 series don’t have a stopwatch timer for length of power on so using an app is the method for tracking true battery life with those products. And what’s really nice is if you close the program, the watches still tick onward like the sands of times. So how does this have real world applications other then it’s neat? If you work on a reality tv show sometimes you have more transmitters out then recievers in a single bag. If you are working as a Utility you sometimes aren’t able to have your follow cart next to the mixing cart and able to glance at the Venue for battery meters. But if you know stuff like a Zaxcom TX will last roughly 5hrs on the IKEA LADDA then you can be on top of the battery changes before anyone ask. Kinda a niche app but it may be helpful for some. I found it helpful and i forsee myself really utilizing it a lot in the future.